On Monday, I said Leon Durham was the last Reds “fun card” from the 1988 roster. Guess what? I was wrong. The late Eddie Milner was a 21st round draft pick for the Reds in 1976. He clawed his way to the major leagues, debuting in 1980. He only played a handful of games in 1980 and 1981, but by 1982 he was a mainstay on the roster. Sadly, Milner battled substance abuse during his time in the bigs. 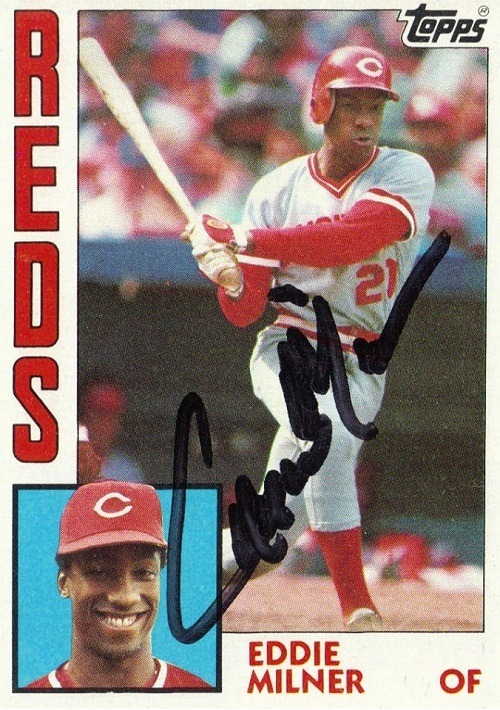 In 1987, Cincinnati traded the outfielder to the Giants for Frank Williams and a couple of minor leaguers. He only stayed in San Francisco for a year, and signed with the Reds again in 1988. He collected nine hits in 51 at-bats during his final big league season. Is that it? Did I include everyone from the Reds 1988 roster? I think the only player left out is Pat Pacillo, who had a Reds card and was traded to the Expos with Tracy Jones, but never appeared in a big league game for Montreal. Since Topps didn’t make “Pro Debut” cards in 1988, I think I’m safe in excluding him from this series. Which means I’m done! I love the 1988 design and intend to do more with it at some point. After all, there are always “Music Fun Cards” that can be made! 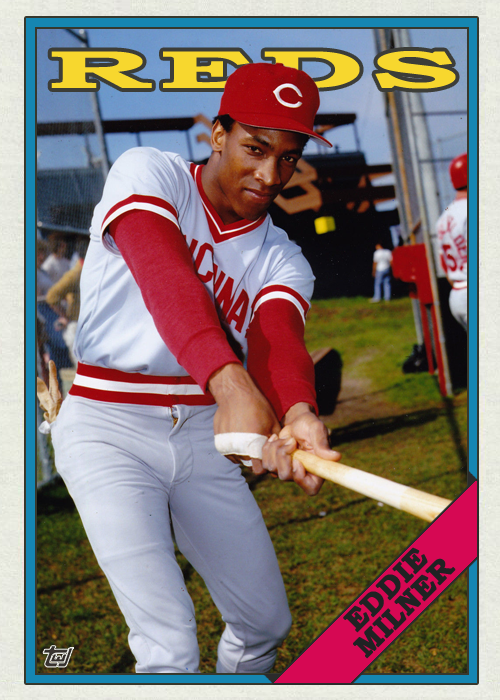 Happy Reds birthday, Eddie Milner! Another former Red that struggled with substance abuse, Eddie Milner passed away in 2015. Never an All-Star, but a fan favorite in the 1980s. 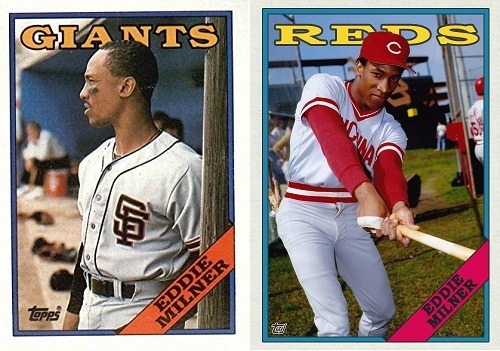 Speedy outfielder for the Cincinnati Reds (1980-1986, 1988) and San Francisco Giants (1987), Eddie Milner passed away yesterday. He collected 145 stolen bases in his career, including 41 in 1983 and 35 in 1985. A very long wait for this return. 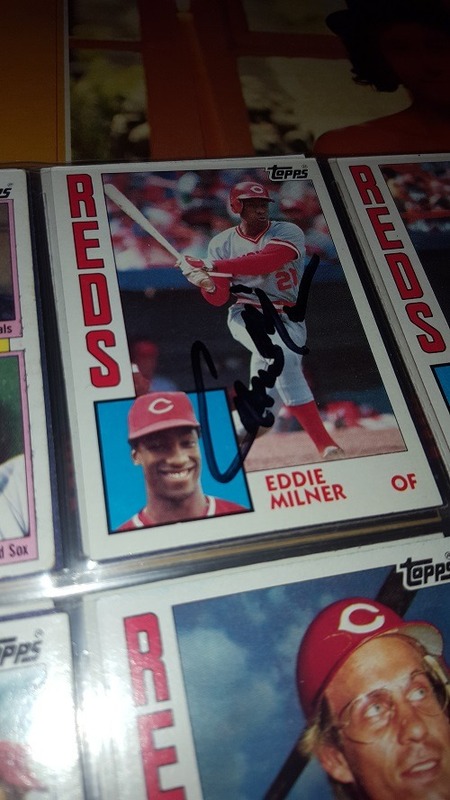 I sent three cards to former Reds outfielder Eddie Milner in October 2012, and 438 days later two of them were returned to me. Unfortunately I did not receive back his 1985 Donruss issue, so I will have to purchase another to fill that hole in my team set from the year. I think this 1983 Topps may have been one of the first cards I ever received as a kid. And I mean this actual card. It has never left my collection, except for the 438 days it spent with Milner himself. I had given up on these cards coming back, and had already replaced the 1984 card prior to Redsfest so I could get it signed for my 1984 Topps project. Which I did. And now I have two. My son that didn’t attend Redsfest will add this to his collection. I still have four outstanding autograph requests from 2011, three from 2012, and one from 2013. I recently sent out four more, and plan to do more soon. Tom Seaver’s first Reds card! Score! There were a couple more Seavers in the box as well. I actually didn’t have very many Reds cards of Tom Terrific, as I didn’t start following baseball until after he was in the American League. I never got to see him pitch. But he will always be the guy who received 98.84% of the Hall of Fame vote for the highest percentage in history, only five votes shy of unanimity. Eric the Orange! One of those teams he hopped to in the 1990s. Let’s see, the Reds traded him to the Dodgers, he also played for the Tigers, Orioles, Reds again, and the Cardinals. Oh, and he ended his career in 2001 with San Francisco. But in my eyes, he’ll always be the center fielder for the Cincinnati Redlegs. Chris Sabo…but wait, he is wearing a White Sox uniform! I only had a couple of post-Reds Sabos in my collection already, and neither of them were White Sox cards. So I am more than happy to add this to my Sabo binder! I will never ever ever complain about getting a Ted Kluszewski card, even if he is pictured with the Angels. 🙂 The Big Klu has become one of my favorite all-time players in the past year. The more I read about him, the more he moves up the list. Did you know he played football for Indiana University, and the Reds just happened to see him hitting one day while they were training in Bloomington? They didn’t sign him on the spot because that would jeopardize his college career, but they struck a deal with the athletic director to call them if any other baseball teams expressed an interest in him. The Tigers were scheduled to come down one day, but the Reds beat them to the punch because of a phone call. The 1982 Reds Leaders…OK, so 1982 was not a good year for the guys. But I didn’t have this card yet, and as luck would have it, there were two in this box…so one for the Reds collection, one for the Soto collection. How awesome is that? Tom Hume rookie card! No way! Eddie Milner “XRC”! Double no way! OK, so neither Hume nor Milner were big names outside of Cincinnati, but while they donned the Reds uniform they were dependable and somewhat decent players. Milner had some personal problems later on in his career, while Hume went on to join the Reds’ coaching staff. A couple of solid additions to the collection. As I said, this is only scratching the surface. There were loads of other good cards in this box, from Cesar Geronimo to George Foster to Joe Morgan to Pete Rose and on and on and on. 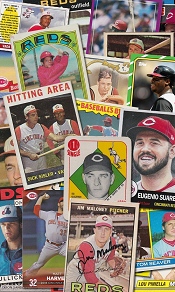 A big thanks to GCRL, who definitely filled several holes in my ever-growing collection of Cincinnati Reds!